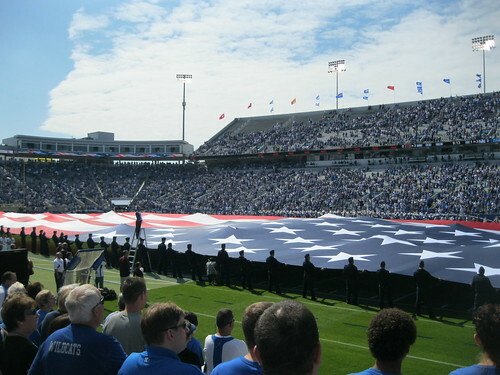 An Upgraded Commonwealth Stadium - Lexington, Ky. Yes, it is a difficult time to be a Kentucky football fan. This is not an opportunity for Louisville fans to gloat, either, as both teams sit at 2-4. A recent Herald-Leader article points to Kentucky's statewide battle against New Mexico's FBS teams for the worst statewide college football landscape. What an honor. 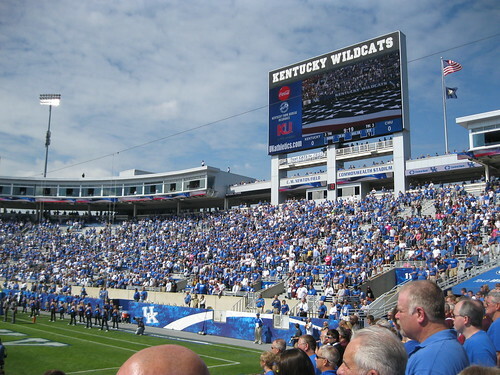 But at least UK fans can enjoy a few facility upgrades in the technology department over at Commonwealth Stadium. And with the team's lack of on-the-field success, tickets should be very easy to come by. New video boards at either end of the stadium are 37' x 80' apiece, each ranking 15th nationally for largest video boards. 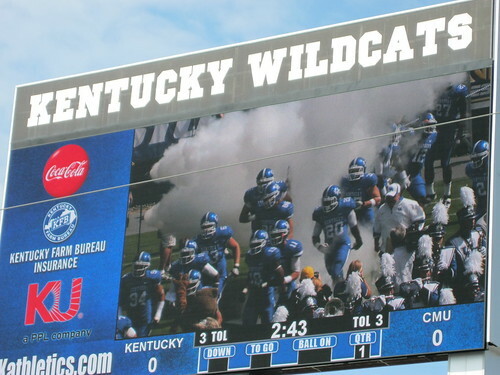 The Daktronics HD boards show a crisp image image during the game that is much improved from the old video boards which were smaller and surrounded by advertising. Today's larger boards include on-screen advertising and on-screen scores and stats. Everyone loves the new video boards, even if a replay of an up-the-middle run or a Tydlacka-punt doesn't necessarily make for the most exciting game. More controversial than Joker's play-calling has been the ribbon boards which surround the stadium immediately below the upper deck. Although I miss the Ring of Honor that saluted former UK standout players, I understand the need to upgrade facilities. And I'm pleased that those players are now honored with flags bearing their names. Even so, it is hard to read those flags and I hope that UK does something more to connect UK football's present to its past. Another issue I have with the video boards is that they are used almost solely for advertising. Scores and stats of the current game appear on both sides of the 50-yard-line and KCTCS, McDonalds, and information about the next women's volleyball game appear elsewhere. Now I understand the need for advertising revenues, but I was very excited about these ribbon boards because I had hoped we would see regular, live updates from around the conference and around the nation. But alas, these updates are only occasional and are relegated to a small panel at either end zone (the other small end zone ribbon board panels offer play-by-play commentary in closed captioning). Yes, the upgrades are nice. But they could be better. 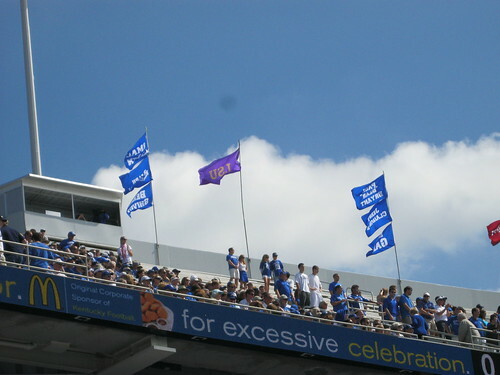 But we must relish the fact that in terms of total square footage (combining both big-boards and the ribbons), Commonwealth Stadium ranks #3 in the country! That may end up being UK's standout statistic of the season. Win or lose, come out and support the Cats! This is homecoming weekend and we face FCS' Jacksonville State. Help the 'Cats "bring home the victory!"